This guide paves the way to snowboarding and skiing in El Colorado Ski Resort in central Chile. Let’s dive in, El Colorado’s ski season kicks off as early as mid-late May! El Colorado Ski Resort is located above the mountain town and small ski area of Farellones, Chile. The two resorts are interconnected under one lift ticket, so you can access El Colorado from the Farellones base area lift system. Just over a one hour drive from Santiago, it’s the closest ski resort to the capital, and very popular with the local Chileans. Depending on the service used, road conditions, and day of the week, driving from Santiago to El Colorado ski area generally takes 1.5 hours. The road known as G-21, or Road to Farellones, is narrow and has many switchbacks on the steep climb, with over 6,200-8,170 feet (1890-2490 meters) of elevation gain. The road forks as you arrive to the entrance of the town of Farellones. The left turn takes you thru the village of Farellones and up to El Colorado and La Parva resorts. The right continues climbing past the cliffs and backcountry terrain known as Santa Teresita on your left, taking you to Valle Nevado Ski Resort. Going to El Colorado, you want to turn left into Farellones. An economical way to get to the mountains. There are several services offered online and in Santiago. If you are on a budget and have the extra time it takes to pick up other passengers around the busy city, and dropping them off at the different ski centers, this can be a OK option. Details can be found online or booked directly from the airport upon arrival. Do your research. Many have poor reviews and we cannot comfortably recommend a specific company. While Trip Advisor is known for false reviews and has lost trust to many savvy travelers, it can be a start to find a transfer company to get you where you need to go. Renting a car or better off, 4×4 truck or SUV is an option. If you are staying off the mountain or you are visiting several areas during your trip or plan to run backcountry road laps in Santa Tere, a vehicle can be worthwhile. Just keep in mind gas is expensive, the roads are not easy, and you will need to carry snow chains, even during a dry period. An international drivers license is required. Hitching a ride up to the mountains is not that difficult however on weekends you will be competing with a lot of locals. Bring your best thumb and some patience and you will eventually get a ride. Best place is a few hundred feet up the G-21 road after it branches off Ave. Las Condes. There are a few ski rental shops and quick markets on the right. If it is too competitive, you can try to find a ride from those stopping to rent skis at one of the shops. Backcountry skiers and snowboarders have added this resort to their radar due to some of the best out of bounds, big mountain road lap runs in all of South America. But you really have to know where you are going. What is The Ski Terrain Like on This Cone Shape Resort? When visiting, take note that the cone shaped mountain is the real ski center for skiers and riders, with 75km of skiable terrain over almost 360 degrees. Farellones has mainly beginner slopes and all the non-skiing activities like snow tubing, zip wire and sky walking, along with some raucous apres ski and nightlife. El Colorado ski area actively develops its mountain infrastructure every year – especially the terrain park, on hill guest facilities and the off-piste, backcountry access. A growing number of northern hemisphere ski and snowboard teams come to train on its slopes and snow park, and use the area as their base camp for product testing, catalog and video shoots. The snow park is billed as the best terrain park in South America, and is the largest in Chile. The park is added to and refined each year, with the machine specialist flown in from Andorra every winter. This year the park has more than 40 features and several hits, and the freestyle zone includes a 250 meter boardercross zone. Freestyle skiing and snowboarding in El Colorado has really taken off over the past few years thanks to the investment into the park area and weekly events and contests. The terrain park is not just for the pros. The team designs the park with the motto la Diversión es Progreso (Fun is Progress), and want to cater to all levels of snowboarders and skiers. Levels of difficulty are marked with a blue line for novices, a red line for intermediates and a black line for experts. About 10 percent of the terrain is marked for experts, but trust us, there is a lot more than meets the eye. The best El Colorado skiing and riding is to the east of the cone (not visible from the base of the ski area), looking towards Valle Nevado, where snow is deep thanks to the Andean winds and steep lines drop through cliff bands. Access by draglifts (t-bars and Pomas) means the beginners tend to stay around the front of the mountain, where there are plenty of nice slopes to play on. Also on the eastern side, the off-piste skiing and snowboarding is fantastic in the Valle Olympico after a snowfall. They have recently opened a new drag lift, Los Pioneros, accessing 13 new runs and fun open powder bowls. For backcountry skiers and riders, there is some stellar terrain here that we cover in just a bit. This is a playground for intermediate skiers, with nice groomed pistes fanning out from the cone, and the chance to dip off-piste alongside. The resort holds a good pitch from top to bottom. 40% of the mountain is marked as intermediate. It’s a friendly area for beginners, with 15% of the mountain designated beginner slopes. Both Farellones and El Colorado host international, bi-lingual schools where you can hire private or group classes. There is also plenty to do at the adjacent Farellones ski center including a massive tubing park, and of course plenty of après-ski. Location: Village of Farellones/El Colorado, Central Chile. 45 miles east from Santiago. What’s a powder day like at El Colorado, Chile? Check out the short video below with pro rider and Farellones local, Manuel Diaz. El Colorado, Chile is linked to the other two major ski centers, Valle Nevado and La Parva. These three resorts together make up the “Three Valleys”, South America’s largest combined ski area with amazing back country terrain and stellar views of the high Andes. In order to link more than one ski area, you need to buy a multi-resort ski pass. These passes are available daily, at each resort, weather and snow quality depending. For off-piste and backcountry, Cono Este on a powder day and Santa Teresita on any day, nuff said. Maybe even a taste of the Castle Greyskull if you can find the entrance. The whole front of the resort looks over the Santiago valley; on the west you can see La Parva and the eastern side connects to neighboring Valle Nevado. If you are staying in the village of Farellones or El Colorado, you have walking access to the ski lifts. 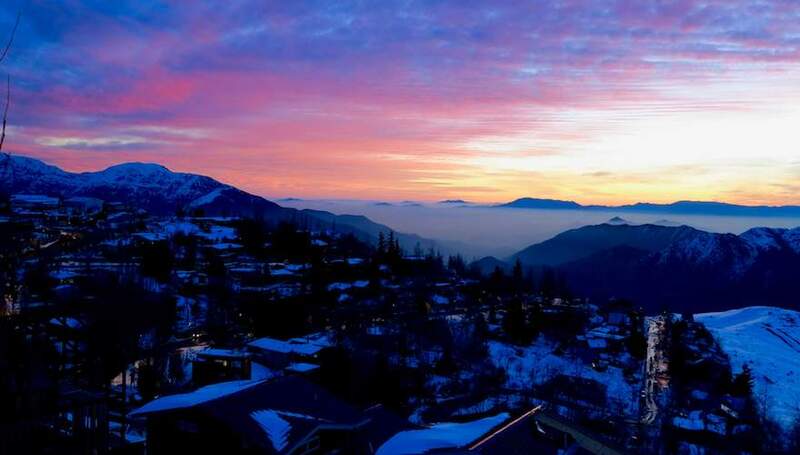 This holiday spot is not as international as its well known neighbor Valle Nevado. On the slopes you will hear a lot more Spanish than English, and few of the staff are bilingual, so it is a good authentic Chile experience. Food is better than your average mountain food. The five restaurants serve from self-service food to meat skewers and cheese fondues; a new café on the terrain park specializes in gourmet burgers, and a recently-opened Juan Valdez Café means better (but not great) coffee has hit the high Andes. The resort offers similar Three Valley deals to its neighbors, giving you access to the whole area. If you just want to ski or snowboard El Colorado, it is best to avoid weekends and look for special offers running during the week via local cell phone carriers Entel or Movistar. Some of the best expert backcountry skiing in Chile is accessed here in a zone known as Santa Teresita (or Santa Tere). The terrain runs all the way to the road that links Valle Nevado resort and the Farellones village. Men’s Journal Magazine recently rated it as one of the best places to snowboard on Earth. El Colorado’s backcountry terrain is among some of the best resort access around. Take note this terrain is big and once you are in, you are generally committed. Never just follow tracks into this zone. If you do not know where you are going you can easily get yourself in serious trouble. There is also little avalanche mitigation here, except when there is concern that a large slide could close the road below. So, there you have our run down of El Colorado, Chile. If you have been there or plan on going, leave a comment below.